2017 Was Weird For Solar. What’s Coming This Year and Beyond? Several positive trends halted last year, but new sources of strength are appearing. After setbacks in 2017, the solar industry must tap new sources of strength to grow in 2018. The solar industry weathered a particularly strange 2017, but is poised for global growth. If the right factors come together, solar power could provide 15 percent of the global electricity mix by the 2030s, rather than the business-as-usual rate of 5 percent, said MJ Shiao, Wood Mackenzie's global lead for renewables and emerging technologies, during a presentation at GTM’s Solar Summit in San Diego Tuesday. Achieving that level would make crucial strides toward global climate-change mitigation, but requires overcoming notable obstacles. In recent months, module prices have actually risen, growth in the U.S. has slowed, and policy fluctuation has introduced uncertainty. Over the long term, the growth of solar creates problems for itself by reshaping grid dynamics, tanking prices in the sunny hours and ramping them up for the morning and evening peaks. “We’re on the cusp of a broad transformation, but we haven’t gotten there yet,” Shiao said. Last year bucked a long-running trend in U.S. solar deployments: They finally went down compared to the year before. 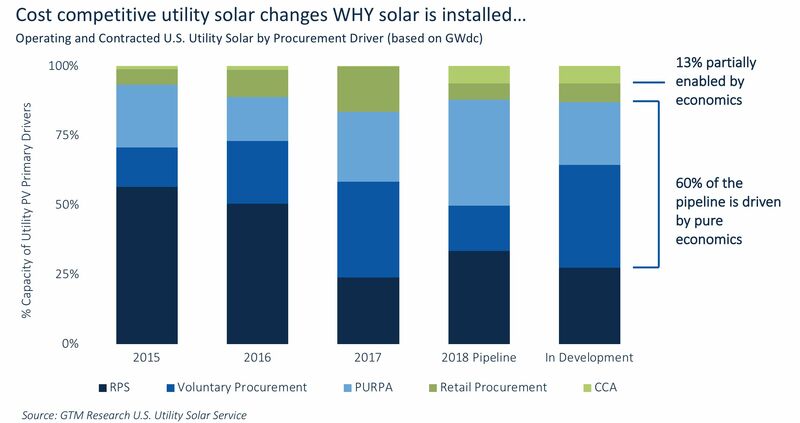 The downturn came from a slowdown in distributed solar combined with a decline in the contracted utility-scale pipeline. It didn’t help that the original federal Investment Tax Credit expiration pulled ample capacity into 2016 deployment, leaving pipelines depleted for 2017. Adding to the weirdness, module prices moved in a new direction. “They did fall in many markets, but we saw the first global average uptick in years,” Shiao said. 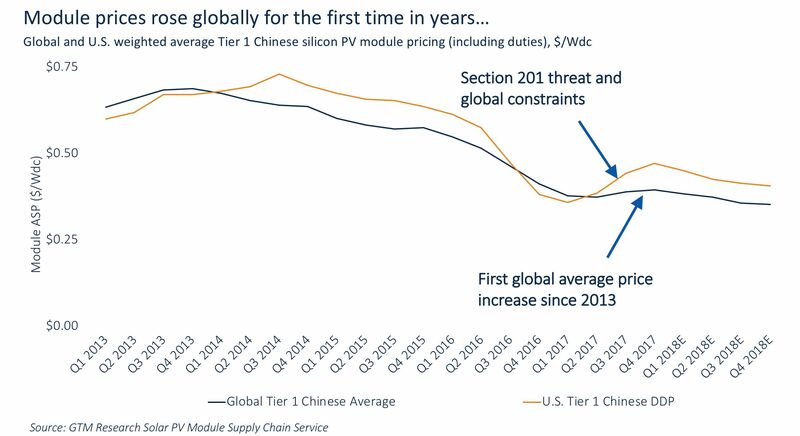 That movement resulted from supply constraints from China’s deployment ramp-up and hoarding in advance of the U.S. solar tariff decision, among other things. The industry has reason to hope for a better 2018. 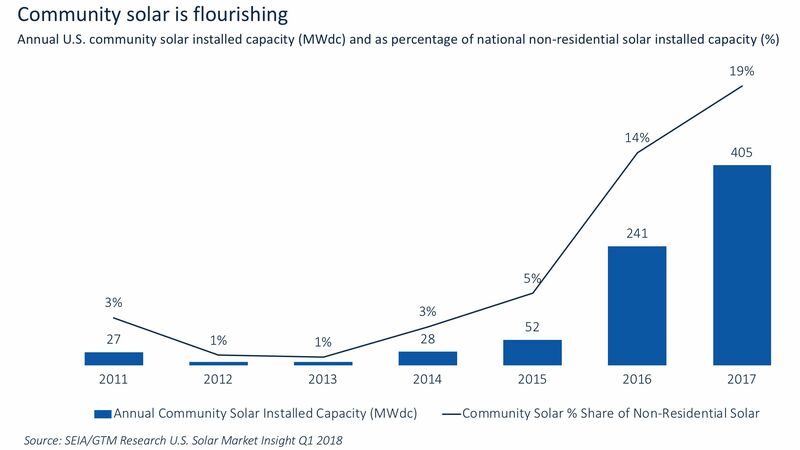 After years of policy and regulatory roadblocks, the community solar market is breaking free and achieving substantial growth. “We finally have been able to open up these markets and install a record amount of community solar,” Shiao said. 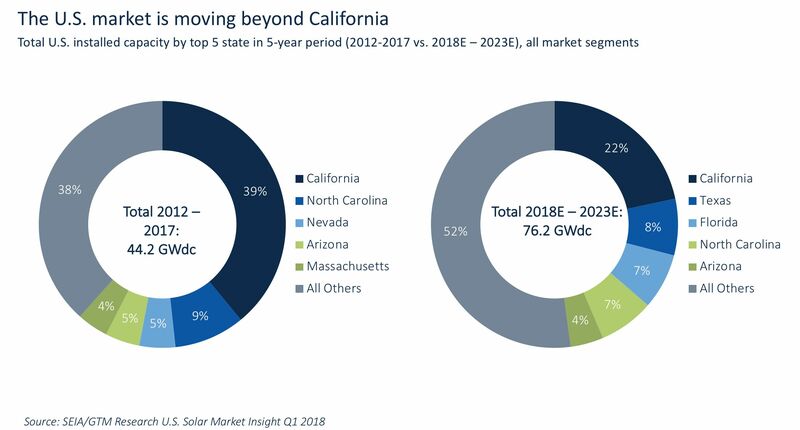 Solar deployments have grown increasingly diversified across the U.S., which insulates the industry against swings in the largest market, California. That state represented 39 percent of installed capacity over the last five years, but will account for only 22 percent of solar installed in the next five years. “We’re going to see solar spread throughout the U.S., as well as the emergence of large sunny states like Florida and Texas,” Shiao noted. Those states haven't tapped their massive solar potential, but are poised to surpass current No. 2 market North Carolina over the next five years. Perhaps most striking, the cost-competitiveness of solar has changed the breakdown of why states deploy it. Legal mandates such as renewable portfolio standards led the charge when solar cost more than grid power. Now, those mandates have ceded ground as a driver for deployments. Utility-scale power-purchase agreements even compete with the cost of a new-build combined cycle gas plant in the U.S. The thing solar can’t do is provide dispatchable power in a manner similar to gas plants, but that’s starting to change too. 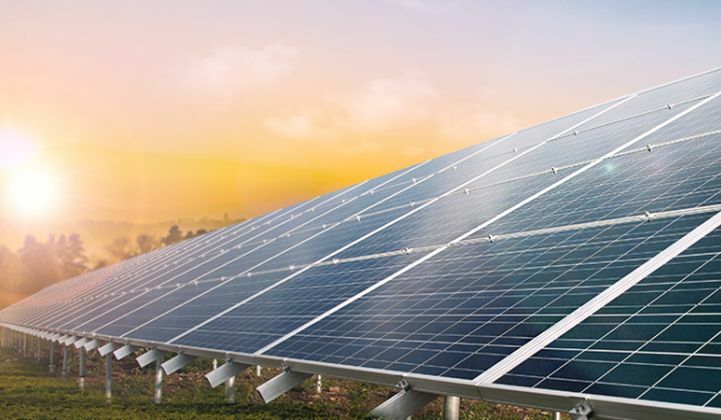 Groundbreaking solar-plus-storage projects, like the Tucson Electric Power contract awarded to NextEra and the bids for Xcel’s all source procurement, have brought firm solar power into the realm of affordability. “We're starting to see solar become more than just a pure generation resource,” Shiao said. The advances in solar economics promise to reorient how the grid works, setting up new kinds of operational complexity. 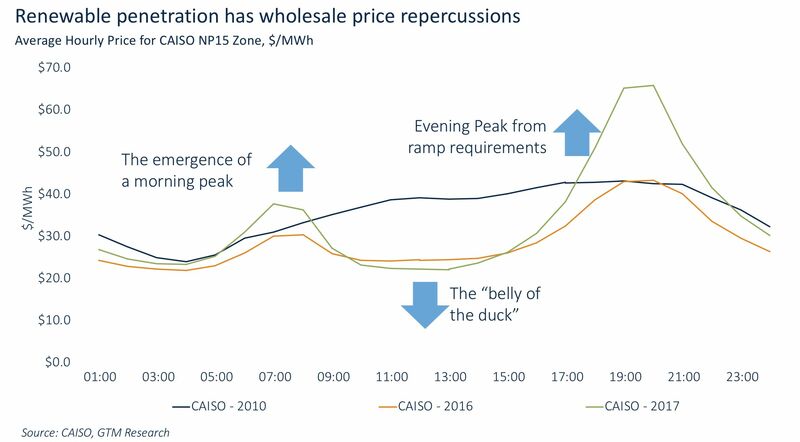 High penetration of solar depresses electricity prices in the middle of the day, and amps up the peaks before and after the solar generation arrives. The "duck curve" has already emerged in California, where it continues to grow, but it has also begun to appear in Texas and New England. 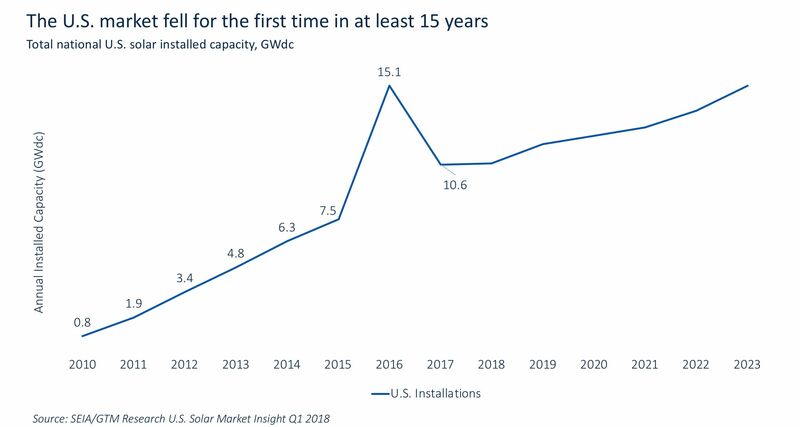 This poses an enduring threat to solar business models: If the value of solar generation continues to drop and curtailments rise, it will become harder to sustain new capacity. 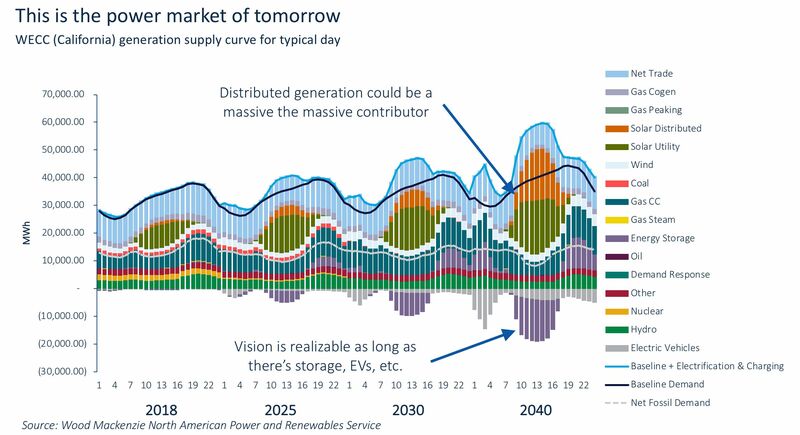 Energy storage looks increasingly like the one to help with this predicament. Its price has declined significantly, and business model innovation continues to grow. Storage project design and financing are more complex than the straightforward generation of electricity. 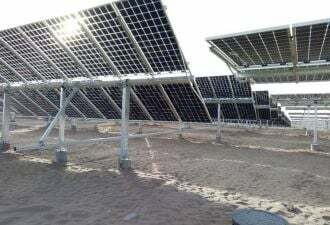 But already, trend lines are pointing to a future grid system where distributed and utility-scale solar provide the majority of electricity on certain grids, enabled by energy storage and electric vehicles (seasonal swings create problems when the grid approaches 100 percent renewables, and the jury’s still out on how to cost-effectively manage that). Wood Mackenzie's business-as-usual case sees the solar market swelling to $1.5 trillion over the next 15 years, delivering 5 percent of the global electricity mix. That’s a huge improvement from today, but does not go far enough to tackle the Paris Agreement’s global commitment to confronting climate change. In an aggressive case, Shiao noted, solar could push to deliver 15 percent or more of the global electricity mix. He left the room of solar professionals to ponder how to achieve that.